Just a fairly straightforward photograph, taken on a leisure trip at weekend, pottering around the Dorset and Somerset countryside. Most of us (well, us blokes) seem drawn to old cars, unless we have to work on them, of course; in which case, we’d probably rather have something new that seldom needs attention. This is a Ford Consul, probably dating back to the early 60s. 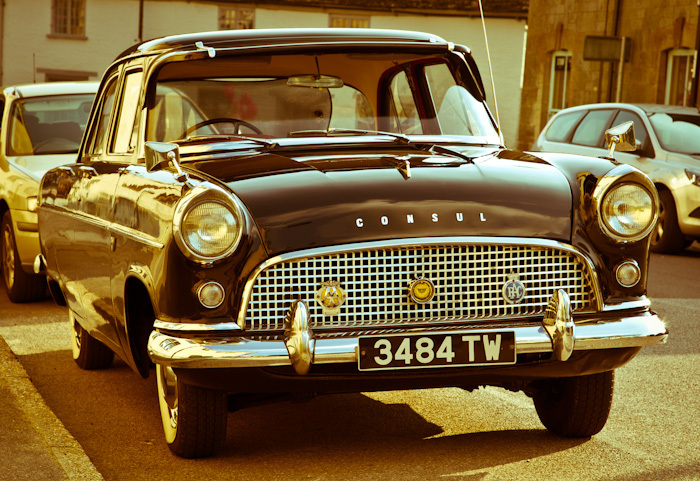 My dad had a very similar model: a Ford Zephyr, which was basically the same car, with slightly different treatment of the grille and boot. But while I almost float into nostalgic reverie, my mind goes back to the fact that ours was an absolute rust bucket. There was so little left of the floor and sills that, if it were around now, it would never be allowed on the road and would probably be beyond any repair that would make it roadworthy. The owner of this must be a very committed individual.